Digital printing is becoming more popular and affordable. But is it ready to derail the king of textile printing – screen prints? Here are a few points on DTG vs. Screen Printing. Long story short – screen still rules for bulk printing. Both the printing techniques are suitable for t-shirts, hoodies, sweatshirts, etc. Screen printing is typically done by applying ink through a mesh-like stencil of the design. This is generally a manual process, and hence labor intensive. The ink spread has to be done individually every time for each color. So multi-colored prints take time, as each color is separately applied. Also, a separate stencil has to be created for each color. This entire procedure is redundant in direct to garment (DTG) printing. 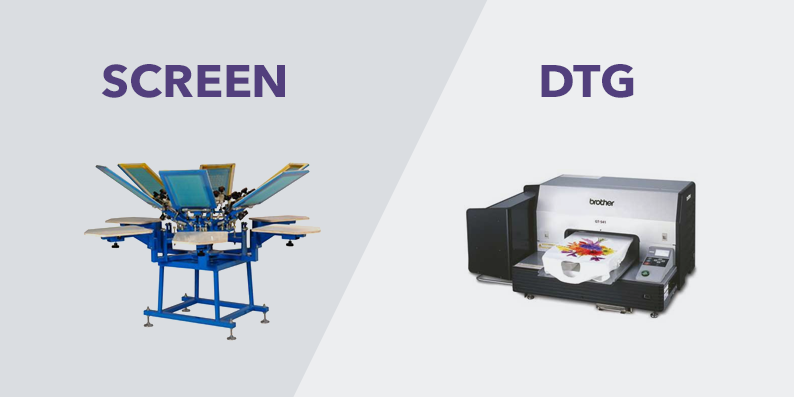 DTG is essentially digital, that is, it is similar to inkjet printing technology. The design can hence be of any number of colors. The print timing doesn’t depend on the type of graphics. Every print comes out in one go. Even though it is more convenient to print on DTG, it is an expensive process when it comes to bulk printing. Screen printing turns to be economical in the war of DTG vs. screen printing. But for printing a single piece, screen print is not viable as a separate dye has to be specially made for each color. Here, DTG printing comes as a boon. Single piece orders can be processed economically using this technology. Hence users can print their designs using custom t-shirt designing tools like inkXE without having to bother ordering ten pieces of the same model. It is impractical for someone to order multiple parts of the same t-shirt unless there is a team or event requirement. Modern DTG has overcome problems like white base requirements for printing on a darker material. Screen printing is a labor-intensive but one of the best, most-popular and definitely a cost-effective method of printing artworks on t-shirt. Compared to DTG, screen printing is a little complicated. Where in DTG, the artwork is printed as a whole on the t-shirt, for screen printing the design has to be broken down into various layers of colors. This makes screen printing limited on to a certain kind of prints on fabric. DTG is a rather new t-shirt printing method where a digital printer applies ink directly onto the fabric. Because it is digitally printed by a machine, there’s no limit to the types of designs and the number of colors you can use. DTG create vibrant prints with a high level of detail. Although it is a great option for elaborate designs on t-shirts, it does make it expensive compared to screen printing. DTG printing produces only a single layer of ink for the final design, whereas screen printing employs multiple layers to produce its final design. Screen printing will produce more saturated and vibrant colors for the design but the colors used are limited, whereas DTG produces a detailed artwork with unlimited colors but produces a slightly faded design for its single layer of ink. Screen Printing – It is cost-effective for larger batches but not much for one-offs. Preparing stencils for the projects means it has a high setup cost, making it inefficient for small orders. Since each color needs its own stencil, the final prices might be higher for the set-up cost. Once the screens are made you can print as many t-shirts you like using inexpensive tools, making it highly cost-effective for large orders. Cost per shirt drops with an increasing number of orders. DTG printing, on the other hand, is more cost-effective for smaller batches and the number of colors used will not affect the final price. On the contrary, large batches will use up more ink and take more time which makes large orders rather expensive. DTG machines itself cost a lot, at least above $50,000 for a professional setup. Cost per shirt remains the same even with the increasing number of orders. Screen printing can be done pretty much all types of fabric, only you have to take care of the type of color you use for the type of fabric. You can use water-based or plastisol ink on cotton, silk, wool, polyester, and jersey fabrics. DTG is best with 100% cotton, especially combed and ring-spun cotton to create the best printing surface for DTG printers.